Kumbha Mela is an integral part of Hindu tradition, beliefs and mythology. According to the beliefs, in Hinduism, the Kumbh Mela is a pilgrimage that is celebrated four times over a course of 12 years. The event is expected to attarct over 10 lakh devotees. Along with Prayagraj in Uttar Pradesh, another tiny town of the state of Karnataka is also getting ready for three days Kumbha Mela which according to the estimation done by the Karnataka government expected to witness the arrival of over 10 lakh devotees from across the country. 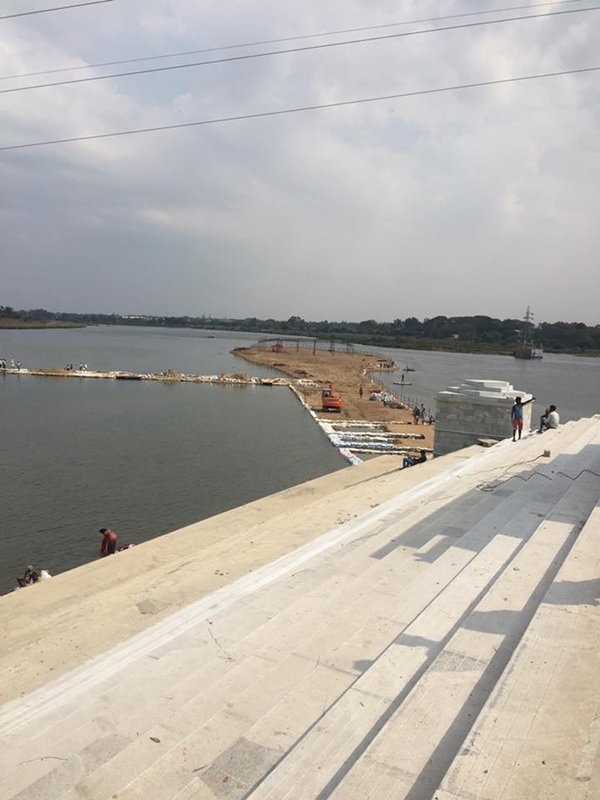 T Narasipura, the confluence holy rivers Cauvery, Kapila and Spatika Sarovara which is gupta gamili like Saraswati River is all set for the 11th edition of the three-day long South Indian Kumbha Mela. This Kumbha Mela was started in the year 1989 by various pontiffs from Karnataka, Tamil Nadu, Kerala, and Andhra. This year the Kumbha Mela will take place from February 17th to 19th. In T Narasipura the River Kapila confluence with Cauvery and invisible Spatika Sarovara. Thus it has been called as Triveni Sangama (confluence of three rivers). Triveni Sangama is a sacred place for Hindus. People visit here to take a holy dip. There is a belief among Hindus that if we take a holy dip in a confluence of the rivers they will become free from all their sins forever. Prayagraj in Allahabad is a one such Triveni Sangama and it is a confluence of the river Ganga, the Yamuna and mythical river Saraswathi. Tirumakudalu Narasipura which is known as T Narasipura in Mysuru district and it is 35 kilometers from the city. The famous Gunja Narasimhaswami temple located here. It is situated on the banks of the river Kapila which is also called as the Kabini. The concept of the South Kumbha Mela has been conceived nearly 30 years ago and it received overwhelming support from the devotees and the governments. This Kumbha Mela provides a great opportunity for South Indians to take part in one such auspicious occasion. Instead of traveling a great distance to North India South Indians can take a holy dip here and become free of all the sins. Kumbha Mela initially started by Sri Tirucchi Mahaswamy of Kailas Ashram, Sri Balagangadharanatha Swamiji from Adichunchanagiri Mutt and Shivarathri Deshikendra Swamiji of Suttur Mutt. In North India, Kumbha Mela takes place in Prayag, Nashik, Haridwar, and Ujjain. According to their plan, this Kumbha Mela was organized for the first time in a big way in the year 1989. As T Narasipura has a confluence of rivers seers decided to organize this event here. A weighing machine situated in Gunja Narasimha Swami temple says that T Narasipura is more sacred than Ganga Theertha. Ancient places like Bharadwaja Rushyashram, Chowdeshwari temple, Rudrapada, Akshaya Vatavruksha, Ashwatha tree, Vyasaraja Mutt and other temple shrines situated here have made the city a divine location. Mysuru district administration and the state government are gearing up for this event. Special committees, special police forces are formed to ensure the grand success of this event. In order to facilitate visitors, special arrangements have been made in bathing ghats to take a holy dip in the river without any problems. 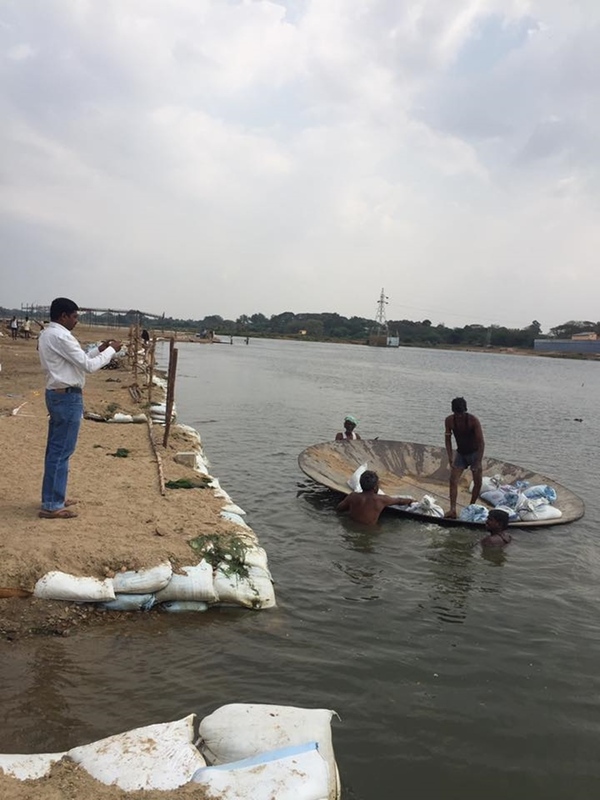 Sandbags have been installed inside the river for the safety of the devotees. Temporary rooms have been built near the temple and river for devotees to change their dress. A temporary bridge has been built between Narasimha Swami temple and Vyasaraja mutt which are situated in old Tirumalakudu. 12 ft width and 12 mt long bridge will help the public to walk between these two places. Special focus has been given to the drinking water facility. Ten minibusses will be operated within the T Narasipura to ensure frequent service for the devotees to reach Agastheshwara temple from the bathing ghats. Temples here will host various religious conferences and cultural events during all these three days. All these temples, buildings and streets will be decorated on the lines of Mysuru Dasara. District administration and Kumbhamela Celebration Committee are struggling to provide all the infrastructure facility to avoid inconvenience for the devotees. On the first day (February 17th), in the morning on the special occasion of Magha Shuddha Trayodashi, pontiffs will take up Kalasha Stapane, Ganahomaand Devatharadhane. Seers will enter the city on the same day at 4 pm. Seers will inaugurate the Yagashala at 6.30pm. Gangarathi and Deeparathi which is being practiced in Varanasi have been arranged at 7 pm. All seers who take part in Kumbha Mela will enter the city through the grand procession. This procession will begin from Gunja Narasimha Swami temple and moves towards Vishwakarma Beedi, Bhagavan talkies road, Link road, Bus stand and reaches to Triveni Sangama. Bhajan troupes, Veeragaase Kunitha, Poorna Kumbha, Kamsale Dance, Pooja Kunitha, Verabhadra Kunitha, Gaarudi Kunitha, Kolata, Veera Makkala Kunitha, Keelukudure, Patakunitha, Tamate, Band set, Sevadal and tableaus will be the major attractions of this procession. On the 18th (on Magha shuddha Chaturdhashi, Ashlesha Nakshtra) there will be Punyaha, Navagraha pooje, Navagraha Homa, Punyahuthi. In the evening priests will conduct Sudarshana Homa at 3.45 pm. On 19th (MaghaShuddha Vyasa Poornima, Pushya Nakshtra, Punyaha), Saptanadi Kalasha Pooja and Homa will be conducted. In Kumbha Moohurtham all Kalasha will be immersed in the water. Devotees can take a holy dip in the morning from 9.30 to 9.50 in Meena lagna and from 11.30 am to 12 noon in Vrushabha Lagna, Abhijin Muhurtham. Minister for Higher Education G T Devegowda will inaugurate the programme on February 17th at 8.30 am. Former CM B S Yeddyurappa will grace the occasion. Former chief minister Sidhhramaiah will participate in a religious meeting to be held on Feb 18th at 11 am. Chief Minister H D Kumaraswamy will inaugurate an all religious meeting on February 19 at 12 noon and minister G T Devegowda will deliver concluding remarks. Former Chief Minister S M Krishna will be the chief guest. The Mysuru district administration and the Karnataka government are expecting a huge flow of seers, Naga Sadhus from across the country. Keeping this in mind, a 20-bed capacity mini hospital will be set up. Unani and Ayurveda hospital will be set up for the saints and the sages. 4 ambulances will be kept ready. The nearest airport is in Bangalore, which lies at a distance of 42 kms. From Bengaluru, the easiest route to reach T Narasipura is traveling by train till Mysuru and catching a KSRTC bus which will be in plenty of numbers. T Narasipura is well connected with all the major towns of the Karnataka and Tamil Nadu. The nearest railway station to the place is in Mandya Railway and form here you can avail buses or taxis to reach T Narasipura.